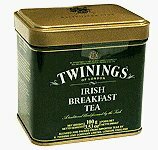 I woke up today with the strangest compulsion to write someting about Irish Breakfast tea. I can't imagine why that would be, but I've decided not to fight it. So onward. Here's a brief article, from Seeds of Knowledge, about Irish tea traditions. Also five related recipes. Over at Barry's Tea is a recipe for a full Irish Breakfast, which is not recommended for anyone with delicate appetites. Here are just a few of the many varities of Irish Breakfast tea. It's still Assam month here at Tea Guy Speaks and since most Irish Breakfast teas are made with at least some Assam tea this entry fits right in in more ways than one. Last of all, let me remind you that the Irish put us all to shame when it comes to tea drinking. So everybody run and put the kettle on and we'll do what we can to catch up.